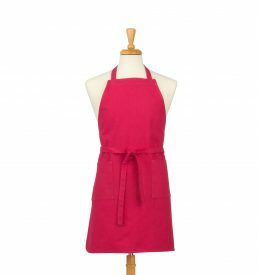 This Fuschia Cotton Canvas Apron is built to last! We use a rugged, heavy-weight 11.5 oz cotton canvas to serve, protect and adorn the chef, server or bartender. Comes with two simple patch pockets. Adjustable ties at waist and neck make this a basic core product. Looks great embroidered! Machine wash and tumble dry for easy care. 30”L x 27” W w/ 36” ties at waist.